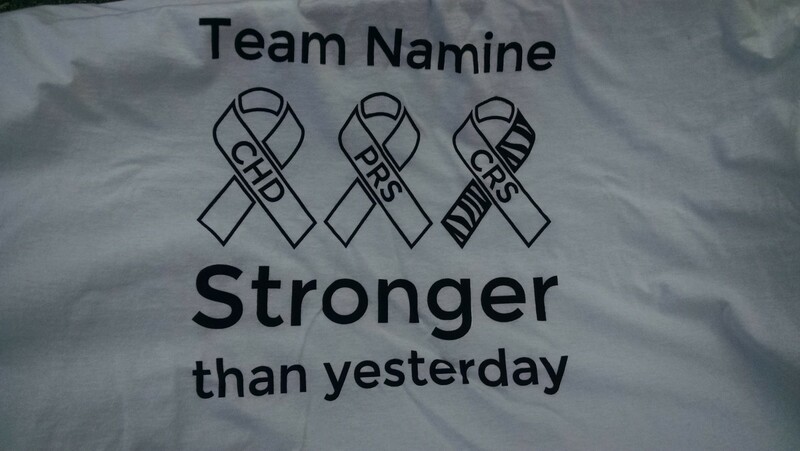 I picked up Team Namine’s shirts for Al’s Run this afternoon. Last year, all three of us — Jessica, Namine, and myself — went to pick up our Al’s Run shirts together. This year, though, Jessica and Namine are helping out with a rummage sale at my mom’s house. That left me to pick up the shirts. On opening the box, I found Namine’s orange (I think) Children’s Champion shirt. Last year’s was red, I think. I am color blind, after all. Unfortunately, the children’s shirts don’t get a custom design on the back. But the adults’ do, and (despite the poor lighting from the overcast weather) I must say, I think it looks nice. 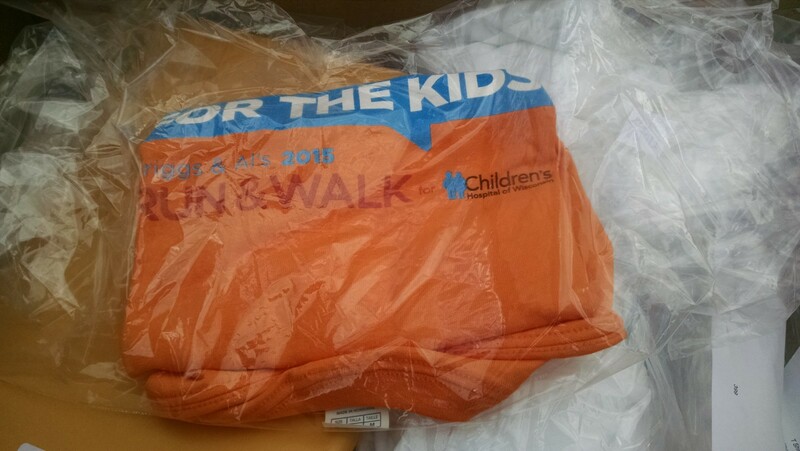 Jessica and I had planned on coloring the shirts with fabric paint — that way, the shirts would remain machine-washable and the color would remain intact — but we won’t have time to get everyone their shirts if we do. 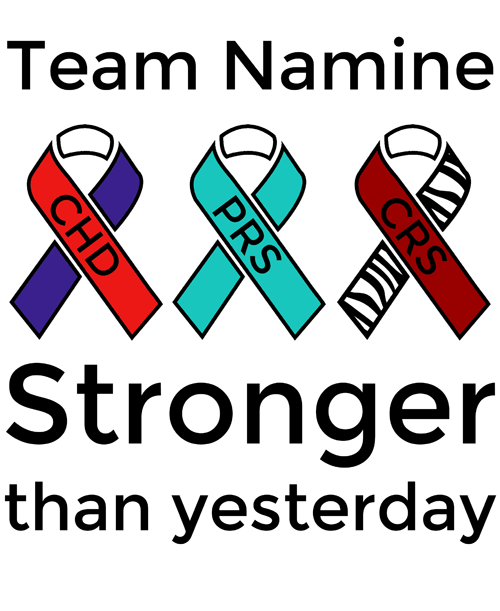 Despite this being Namine’s walking and running team, we can’t attend; our flight to Namine’s Disney Make A Wish leaves that same morning. That said, the only opportunity to get nearly everyone their shirt is tonight, at her Make A Wish farewell party. If wishes were horses, and all that. Still, I think the shirts’ design would look nicer with a splash of color. There’s no ribbon for double-inlet left ventricle heart defect, but the ribbon encompassing all congenital heart defects is red and blue. The Pierre Robin Sequence ribbon is “robin’s egg blue,” if I recall correctly. 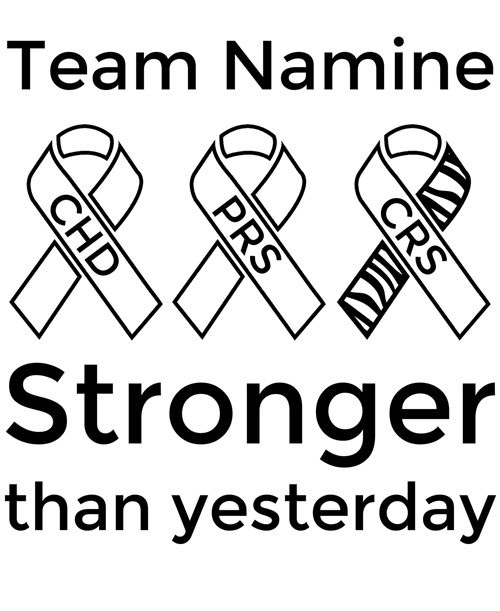 And the caudal regression ribbon is zebra striped (which is universally known to represent rare diseases and disorders) and crimson.